Dealey Plaza, Dallas, Texas. Friday, November 22, 1963. 12.30 PM. Shots ring out. A president dies. And a nation is plunged into psychosis. 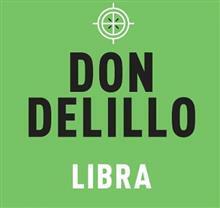 Don DeLillo's extraordinary Libra is a brilliant reimagining of the events and people surrounding the assassination of President John F. Ken... read full description below. Dealey Plaza, Dallas, Texas. Friday, November 22, 1963. 12.30 PM. Shots ring out. A president dies. And a nation is plunged into psychosis. Don DeLillo's extraordinary Libra is a brilliant reimagining of the events and people surrounding the assassination of President John F. Kennedy. Concentrating on the lives of Lee Harvey Oswald, some rogue former spooks unhappy with Kennedy's presidency, and Nicholas Branch, a CIA archivist, trying to make sense of or draw inferences from the mass of information after the assassination, Libra presents an unapologeticly provocative picture of America in the second half of the last century.